One story I have yet to hear is how millennial mom's are making their way through the world. I'm a 20-something mom and wife of two kids. Just like many of you, I have my dreams and passions. I have aspirations of creating something from nothing. I always thought that maybe I would start a business, be a freelance photographer, or a designer, but in the back of my mind there was this constant nudge to have a family. Even when I was pursuing my career in marketing, the prize in my eyes was being a stay-at-home mom. Weird for a millennial with a passion for women's studies, huh? I gave up the personal financial security offered by a full-time job with a 401k to go after a dream. I did it to raise a family. It might not be for everyone, but I know it's a story I wish I heard more of. 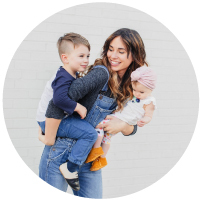 I'm hoping to tell a story that inspires others to push through the struggles of young motherhood, and fight to be a millennial who raised frugal, kind-hearted, and accepting children. This is my story. It's a story of raising our future. It might be a stretch for some, but if there's anything I've learned, it's that going for what you dream is better than never trying at all. Yes!! Love everything about this! I'm not yet a mom, but am also a 20-something millennial who gave up the fast paced career to work at a less demanding job (with a company whose mission and culture I love) and focus on homemaking, slowing down our pace of life, and preparing us for the financial adjustment to me being home full time once we have kids. I'm so glad I've found your blog and am excited to read more!